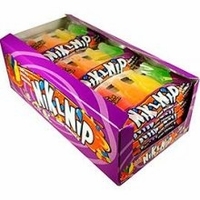 Nik L Nips wax bottles. Wax bottles candy that are filled with juice and look just like mini soda pop bottle. These wax bottle candies are an old time nostalgic candy from the past and at one time were a penny candy. Although these are no longer a penny candy they are still a favorite today. Wax Bottles are popular for 50's party favors, wedding buffets, birthday goody bags or just to eat. I am sure you remember sitting around biting off the tops, then drinking the juice. Once the juice was gone we would sit for hours chewing the wax. You get 4 wax bottles in a cardboard pack that looks like a soda carton. 18 packs per box.